New school year...new school clothes. Give a family in need the school clothes your children have outgrown. The final prayer recited at all three daily prayer services is Aleinu, a beautiful poem expressing the greatness of God, the only God. The prayer begins with the phrase: “Aleinu l'shabay’ach la’don hakol... It is our duty to praise the Master of all...” And while this seems like a common prayer theme, Aleinu was the cause of great controversy. There are two opinions regarding the origin of Aleinu. Many sages are of the opinion that Aleinu was composed by Joshua after his victory over Jericho. Others, however, believe that it was written by Rav (a Talmudic sage). The trouble began around the fifth century (C.E.) When an apostate Jew told the church that within Aleinu there are words that slander Christianity. The verse in question was: "Sheh’haym mishtachavim l’hevel va’rik, u’mitpall’lim el ayl lo yo’she'ah. For they bow to vanity and emptiness and pray to a god who helps not." The verse is actually a reflection of ideas found in Isaiah regarding idolatry, written hundreds of years before Christianity. However, the church was led to believe that va’rik (and emptiness) referred to Jesus, because both words have the same numeric value (when adding the value of the Hebrew letters together) of 316. This claim was repeated over and over again throughout the centuries until, finally, in the early 1700s, Prussian Jews were physically attacked for reciting Aleinu. On August 28, 1703, the Prussian government banned the recitation of this verse and insisted that the prayer be recited by the prayer leader out loud so that government inspectors could make certain that the offending line was omitted. The line, however, was never censored from Sephardi prayerbooks, and in the last few decades it has been reintegrated into many Ashkenazi prayerbooks as well. Click here for a complete translation and transliteration of Aleinu. Try a new kosher wine in honor of Shabbat. Pharaoh, fearing the birth of the predicted “saviour” of the Israelites, decreed that all male Israelite babies must be cast into the Nile. Yocheved, the daughter of Levi, and her husband Amram, already the parents of Miriam and Aaron, divorced because they worried about the safety of additional children. As they were leaders in the community, the rest of the Children of Israel also separated from their spouses. One person, however, disagreed with Amram’s logic. Miriam, possessing great wisdom for her young age (she was 5 years old), said to her father: “Father, your decree [meaning the act of divorcing Yocheved] is more severe than Pharaoh's; because Pharaoh decreed only against males whereas you have decreed against both males and females...” (Talmud Sotah 12a). Amram then remarried Yocheved, and all of the other couples remarried as well. Tradition has it that the date of the remarriage of Amram and Yocheved was the 7th of Elul (today). As a result of their reunion, Moses was born. In the usual "quirks" of the Jewish calendar, 7 Elul coincides with the weekly Torah reading of Ki Teitzei, in which the question of remarriage is addressed--only the question here is a much more complicated relationship: A man marries a woman but he finds in her something “unseemly” (immoral habits, according to the great commentator Rashi), so he divorces her. After she leaves her first husband’s house, the woman remarries and this second marriage also ends in a divorce (or in his death). The first husband may not, according to Torah law, remarry his previous wife after her marriage to another man. The Torah prohibts such remarriages, knowing that whatever troubles this couple had in the past will always haunt their renewed relationship, as will the memories-good or bad-of the second marriage. Lend an ear to a friend in need, but be careful that any advice you give is without ulterior motives. After a large luncheon at which she was a guest, a woman finds a gold bracelet on the ground in the parking lot. There is no lost and found. Should she keep it? You shall not see your brother’s ox or sheep wandering, and ignore them; you shall surely bring them back to your brother. And if your brother is far away, or you do not know him, you will bring it home to your house, and it will be with you until your brother asks for it, and then you shall give it back to him. And so shall you do with his donkey; and so shall you do with his garment; and so shall you do with every lost thing of your brother's, which he has lost, and you have found; you may not ignore it. While the laws of hashavat aveida are quite intricate, one thing is certainly clear, “finders keepers” is not a Torah mind-set. However, neither is allowing yourself to be duped. In the case of the woman above, she would need to let it be known to those in attendance that a piece of jewelry was found, deliberately omitting specific details so that the owner could only claim the object by providing an accurate description of the lost article. Because each case of a lost object has many nuances, Jewish Treats recommends that those who find lost objects consult with their local rabbi about the proper actions to take. Pay attention to the objects you pick up from your desk; make sure they are actually yours. Psalm 27 is read twice daily from the beginning of the month of Elul through the holiday of Sukkot in order to help each Jew connect to the beautiful relationship that one can have with the Divine. Psalm 27 was written by King David, who certainly did not have an easy life (King Saul wanted him dead, his sons rebelled...), and yet King David remained steadfast in his faith in God. With all his troubles, David had the incredible gift of being able to look at the world and recognize the ways in which God constantly protected him. “Had I not believed that I would look upon the goodness of God in the land of the living!--Hope in the Lord; be strong, and let your heart take courage; yea, hope in the Lord." Take two minutes each morning (until the end of the holiday of Sukkot, October 9) and read Psalm 27. Shacharit, the morning service, was introduced by Abraham. Characterized by the trait of chesed, loving kindness, Abraham, who was deeply inspired by God, reflected the zeal and freshness of the morning. The trait of chesed is filled with emotional outpouring and inspiration. Abraham so loved serving God that as soon as he awoke he wanted to share his thanks and praise. The morning service is our attempt to mimic this zeal. Mincha, the afternoon service, was introduced by Abraham’s son, Isaac. Isaac’s dominant character trait was gevurah, inner-strength. While Abraham was inspired and externally motivated by the world he saw around him, Isaac’s trait is internal. The business of the day, the mundane activities of life, all had the potential to distract him, thus forcing him to stop and relate to God from within. Isaac, therefore, is linked to the prayer said in the midst of the day, when it is most likely that one would overlook a relationship with God. Maariv, the evening service, was introduced by Jacob, Isaac’s son. Jacob’s dominant character trait was emet, truth. Jacob is the fusion of the external chesed and the internal gevurah –the combination of zeal and inspiration with strength and physical reality. He is the bridge to the future because he combines the two initial character traits. Jacob sought to serve God at the end of the day, when he had experienced both moments of inspired understanding and moments of deep concentration. The evening service is an opportunity to review the day and look to the future. Find time throughout the day to connect with God. I am to my beloved, and my beloved is to me. When “I,” meaning the Jewish people, can truly give to “my beloved”, meaning God, then God will become ours in a beautiful and divine partnership. Spend the evening celebrating your relationship with God...and have a wonderful Shabbat. Do something special in honor of Rosh Chodesh: have a special dinner, get together with friends, etc. It is normal for people to desire a structured government. In ancient times a monarchy was the only form of government that existed. God understood this desire and told the people of Israel, even before they entered the Promised Land, that they would want a king as well. First and foremost, a king of Israel had to be an Israelite, no matter how attractive a foreign candidate might seem. Regardless of the king's fortune, God also declared that he may not own a multitude of horses. Nor was he to have a multitude of wives, no matter how politically helpful the alliances might be. In these two laws, perhaps God was trying to warn the future King Solomon of his downfall. But Solomon for all his wisdom, did not heed this advice (see Second Book of Kings). Every Jew is considered the son or daughter of the King and should try behave as such. Simeon, a “hot-blooded youth,” often reacted quickly and physically, especially when paired with his brother Levi. When their sister Dinah was kidnaped by the prince of Shechem, Simeon and Levi slaughtered the men of the city, ignoring the fact that Dina’s other brothers had already convinced the residents of Shechem to circumcise themselves and live in peace with Jacob’s family (Genesis 34). This “righteous temper” remained with Simeon. The Midrash identifies Simeon as the one who calls out “That dreamer is coming!” when the brothers see Joseph approaching (Genesis 37:19) and also as the one who threw Joseph into the pit. Many years later, when the brothers went down to Egypt, Joseph demanded that Simeon be imprisoned while the others returned home to get Benjamin (Genesis 42:18-24). “Simeon and Levi are brothers; instruments of cruelty are their swords. In their secret counsel let my soul not come and my honor not be included in their congregation, for in their anger they killed a man, and deliberately crippled an ox. Cursed is their anger, for it is powerful, and their rage, for it is callous. I shall separate them within Jacob and disperse them among Israel” (Genesis 49:5 -7). On his deathbed, Jacob rebuked the brothers so that their descendants would learn that outright cruelty is a behavior foreign to our people. Before acting on a major decision, think about how your actions will effect other people. Located on the north-east coast of South America, Suriname has a small Jewish community with a long history. Today, this smallest of South American countries has approximately 200 Jews, most of whom live in the capital city of Paramaribo. However, there are still two functioning synagogues: 1) Neve Shalom, originally built in 1719, and dedicated to the Ashkenazi community of German Jews in 1735, and 2) Zedek v-Shalom, built in the 1730s for the Sephardic (Portugese) community. The first Jews to settle in Suriname were Sephardic Jews who had fled from Portugal to Holland and then to the Dutch colonies in Brazil. When the Portuguese defeated the Dutch and took Brazil (c.1639), these Jews fled, fearing that an Inquisition would come with the Portuguese. Another population of Jews came to Suriname along with the British, who were also settling the area. By 1661, the Jewish community was large enough to create a community, the “Portuguese Jewish Congregation of Suriname,” and, in 1665, a synagogue building project was undertaken (completed in 1667) in Jodensavanne and named Kahal Kadosh Beracha Ve Shalom (The Holy Congregation of Blessing and Peace). The year 1665 was also historically significant for the Jews of Suriname. On August 17, 1665, the English gave full rights to the Jews of Suriname, allowing them to practice Judaism freely and to run their own affairs. This remarkably liberal charter was allowed to stand when the Dutch conquered Suriname from the British a few years later. And while the next several centuries were not without incidents of anti-Semitism, the history of the Jews in Suriname is, in general, one of religious freedom and tolerance. Conserve water! Taking care of the world is a mitzvah everyone can do! Express the joy of Shabbat by singing. You can even make up your own song. The above verse refers to the mitzvah of tefillin (although the word tefillin does not actually appear anywhere in the text of the Torah). While repeated four times in the Torah, this very limited text is the way the mitzvah is described. 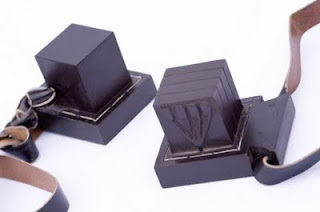 Our entire understanding of tefillin’s physical form comes from the oral law, passed down from Moses to Joshua and onto the elders and the sages. Tefillin are small black leather boxes that are strapped to the arm (tefillin shel yad) and to the head (tefillin shel rosh). The box of the tefillin shel yad (arm) has a single compartment in which is placed a single scroll containing the four Torah passages that refer to this mitzvah: Exodus 13:1-10, Exodus 13:11-16, Deuteronomy 6:4-9 and Deuteronomy 11:13-21. The box of the tefillin shel rosh has four separate compartments formed from one piece of leather--each of the four Biblical sections is written on a separate scroll and placed in its own individual compartment. 1) The scrolls with the Torah verses must be written on parchment with ink, bound by the hair of a kosher animal and wrapped in a strip of cloth. If you own a pair of tefillin, have them checked by a local sofer (scribe) to see if they are "kosher." In older tefillin, the words on the scroll can fade or the stitching can break. There is a famous statement attributed to the American writer James Whitcomb Riley (1849 – 1916) that asserts: “When I see a bird that walks like a duck and swims like a duck and quacks like a duck, I call that bird a duck." And while that conclusion seems logically unimpeachable, the Torah makes a strong point for investigating that duck just a little more--especially when that duck attests to being a prophet. Deuteronomy 13(:2-6) warns the Jewish people that anyone claiming to be a prophet who performs signs and wonders (“miracles” or seeing the future), but tries to entice others to worship false gods, then that person is a false prophet. No matter how convincing that so-called prophet’s magic may seem. The first thought that passes through a modern reader’s mind pertains to the “signs and wonders.” We today are great skeptics of “magic,” but there is conclusive testimony in the Torah that there once were people who knew how to manipulate the forces of the natural world in a seemingly unnatural way. While this was a talent and a skill, it was not a sign of holiness. More importantly, God is reminding the people that all the wonders in the world pale in comparison to what He has shown them and done for them (the Exodus, the splitting of the sea, giving of the Torah on Mount Sinai, etc. ), and that more important than all other things is staying true to our relationship with God. As for the false prophet, he/she shall be put to death; because he/she spoke falsehood about the Lord ... "so shall you clear away the evil from your midst” (Deuteronomy 13:6). When deciding which charities to give to, spend a few minutes to make certain that the money is put to proper use. If you’re a fan of swashbuckling historical romance novels, then you’ll know that, for much of history, there was a pretty good chance that people from all walks of life might be taken prisoner. Imprisoned in jail, held for ransom by highwaymen or taken captive by pirates at sea...all were risks that we may find hard to imagine today. Indeed, in the middle ages it was particularly common for Jews to be held for ransom, sometimes by the government itself. Living in an era when a life of slavery was a definite possibility for one taken captive, the sages were fully aware of the perils of captivity. Indeed, Rabbah ben Mari explained (Talmud Bava Batra 8b) that captivity is worse than natural death, sword and famine, and therefore the redemption of captives is a religious duty of the greatest importance. Maimonides (Rabbi Moses ben Maimon/Rambam Spain/Egypt/Israel 1135 - 1204) wrote that the act of pidyon shevuyim, redeeming the captive, was part of three different mitzvot in the Torah: 1) "you shall not harden your heart" (Deuteronomy 15:7); 2) "you shall not stand idly by the blood of your brother" (Leviticus 19:16); and 3) "you shall love your neighbor as yourself" (Leviticus 19:18). At the same time that the sages proclaimed the greatness of this mitzvah, they also decreed that captives should not be redeemed for more than their worth, to prevent abuses (Mishna Gittin 4:6). These limits were decreed a) for fear of burdening the community with impossible ransom obligations and b) for fear that overpaying would encourage the kidnappers to take more captives. While this concept certainly prevented some redemptions (see the story of Rabbi Meir of Rothenberg), most captives were redeemed, often from community funds specifically collected for pidyon shevuyim. DISCUSSION POINT: In what ways can the mitzvah of pidyon shevuyim be performed in the 21st century? When someone you know is going through a rough patch, be their friend and offer your support. Consoling the mourner (often referred to as paying a shiva call) is one of the most fulfilling, and challenging, mitzvot. One who is going to console mourners (menachem avel) should remember that this is not a social visit. The mourner(s) are not meant to serve as host(s). They will not greet those who enter, nor will they see them out. The food at an Ashkenazic shiva house, unless clearly marked, is for the mourners, not visitors. In Sephardic communities, it is traditional to eat a variety of foods so as to make many blessings in honor of the deceased. If one wishes to bring food to a shiva house, it is advisable to speak to the person who is organizing the shiva to see what is needed. The laws of being menachem avel stress that it is important for the visitor to follow the lead of the mourner. Therefore, it is customary not to speak until the mourner(s) opens the conversation. There may be situations in which the mourner(s) does not feel like talking and therefore says nothing to the visitor. However, the very presence of the visitor serves as a comfort. One should not speak lightheartedly in the presence of a mourner, nor make idle small talk. Visitors are encouraged to speak about the deceased with the mourner, to relate stories and fond memories of the person. Unless there is a clear indication that the mourner wants a visitor to stay longer, 15-20 minutes is the maximum time for a shiva call. At the end of the shiva call, it is customary in Ashkenazic communities to say: May you be comforted among the mourners of Zion and Jerusalem (Ha’Makom yenachem etchem b'toch sh'ar aveilei Tzion vee'yerushaliyim). In Sephardic communities, it is customary to say: May you be comforted from Heaven (Tenuhamu min Hashamayim). If you are unable to pay a shiva visit, call and offer your condolences by telephone. Have you ever forgotten to tip the waiter after eating at a restaurant? Probably not, because that’s society’s conventional manner of thanking the wait-staff. While we do not usually have the opportunity to thank the chefs or the farmers (or any of the other people involved in the provision of food), every Jew has the opportunity--and the obligation--to thank God for providing the food. The mitzvah of making a blessing after food is a direct Torah commandment. “You will eat and be satisfied, and bless the Lord your God for the good land which He has given you” (Deuteronomy 8:10). In actuality, Birkat Ha’mazon is a series of blessings composed by the sages. The first blessing thanks God for giving food to the world. The second blessing thanks God for taking the Jews out of Egypt, establishing His covenant with us and giving us the Land of Israel. The third blessing prays for Jerusalem. After the destruction of the Temple, the words were amended to reflect a longing for the rebuilding of the city and for the coming of the Messiah. There are also special paragraphs recited on Shabbat and holidays. At your Shabbat meal, sing Birkat Ha'mazon aloud together with your guests. For nearly 2000 years, the Jewish people have been in exile. During this time, Jews have lived in nearly every country and under nearly every form of government, while, at the same time, maintaining their own laws as the basis for Jewish society. These Jewish laws (halacha) are based on the traditional understanding of the Torah by the great sages as set down in the Mishna and the Gemara (together called the Talmud), and later codified in the Shulchan Aruch. “Dina d’malchuta dina,” the law of the land is the law, is a phrase repeated numerous times in the Talmud, and always attributed to the sage Samuel. According to Samuel, there is no question that a Jew must obey the laws of the land in which he/she resides... unless that law directly contradicts halacha (for instance a law ordering everyone to worship idols). In certain cases, the rabbis determined that certain rulers and their unfair and harsh laws were dangerous to the Jewish people, and therefore permitted the local Jews to "skirt the laws" or even to ignore them (such as the anti-Semitic decrees of the Russian Czars). In a country like the United States, however, there is no question that dina d’malchuta dina must be strictly observed. What does this mean? This means that being a law-abiding citizen is more that just one’s civic duty, it is one’s religious obligation as well. Taxes, civil law, even the “rules of the road” are our responsibility to uphold. Obey your local traffic laws, staying safe is a mitzvah from which everyone benefits! Tu B'Av, the fifteenth of Av, was celebrated in ancient times by unmarried maidens who went out on this day to dance in the vineyards hoping to be chosen by an unmarried youth to be his bride (For more information on this ceremony, please see:No Holiday As Joyous.) However, this day was marked for celebration for several other reasons. This wood offering is associated with a story of the unique heroism of the Jewish people in their desire to serve God at the Temple. Once, during the times of the Second Temple, the people were prohibited from bringing wood to the Temple by the occupying power of the time. Rather than despair, the Israelites made ladders from the wood and, when asked at the roadblocks where they were going and for what purpose they needed ladders, the Israelites replied that they were taking the ladders to retrieve fledglings from their dovecotes (Babylonian Talmud, Taanit 28a). After passing the roadblocks, the ladders were disassembled and brought to the Temple. If you are single and looking, check out some of the internet's modern day Jewish matchmaking services...you never know! Offer to take a new co-worker out for coffee and fill them in about what they really need to know to be part of your office's "team." Sir Moses Montefiore (1784-1885) had an extraordinary impact on the world. Beginning a career in general business, Montefiore quickly gained one of the 12 brokers licenses allowed to Jews on the London Exchange. When Montefiore retired from business in his early 40s, he was already a wealthy man. Moses Montefiore’s philanthropic endeavors and his willingness to step forward to defend his fellow Jews won him great admiration and fame. He sought the liberty of Syrian Jews imprisoned in Damascus for a blood libel and went to Russia to beseech the Czar for leniency toward the Jews. He was viewed by Jews the world over as their protector and leader. Montefiore and his wife, Judith, supported Jewish and non-Jewish institutions in England. In Ramsgate, where they lived, they built a synagogue and a Sephardic yeshiva. Montefiore is most revered, however, for his charitable work in the land of Israel, which he personally visited seven times. He supported industry and education, but also sought to make the Jews of Israel more self sufficient. Among the famous Montefiore endeavors are the windmill in Yemin Moshe and the building of the neighborhood of Mishkenot Sha’ananim, both of which were unique for being outside the walls of the Old City. A Sephardic Jew, Montefiore’s observance of Jewish law was strengthened by his love of the Land of Israel. He was famous for traveling in his horse drawn carriage with his own Torah and shochet (ritual slaughterer) and for bringing his own dishes and food to banquets. Montefiore was knighted by Queen Victoria, served as the Sheriff of London and was president (1835-74) of the Board of Deputies of British Jews. In 1846, he received a baronetcy. Sir Moses Montefiore passed away just a few months before his 101st birthday. Choose a local organization and commit yourself to supporting it on a regular basis.